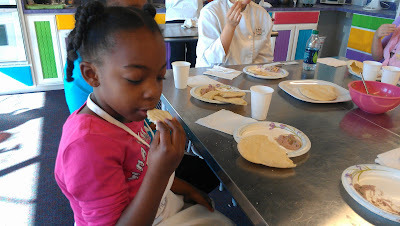 This post is for all of my ATL Bite Lifers with kids. I've been meaning to tell you guys about this place for almost a month now. Smh. Shame on me!!! 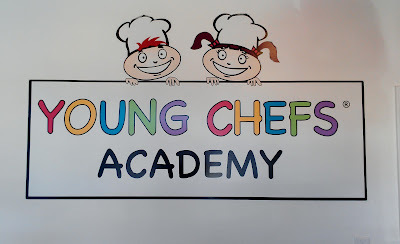 It's called the Young Chef's Academy and it's FANTASTIC!!! Back around late January/early February, I picked a cooler than usual Saturday morning to do something fun and different and educational with my two daughters. While I'm glad my girls have mastered Just Dance 3 on the Wii, I really wanted to get them out of the house and put something new in their heads. Coincidentally, since I've been doing this site, my girls have started to express more of an interest in cooking and eating out (their desire for expensive steaks and crab legs is really starting to worry me). I guess they wanna live the Bite Life too. 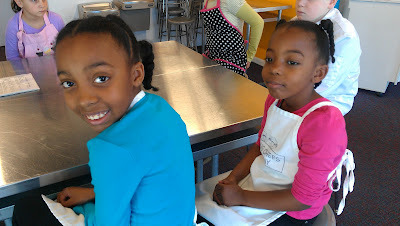 So, I decided to Google "cooking classes for kids; Atlanta". 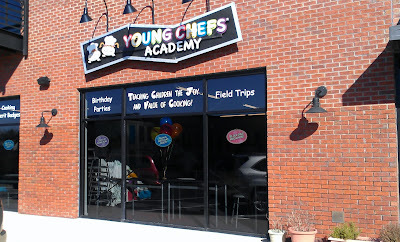 Result #1 - Young Chef's Academy off of Roswell Rd. We walk in the door and I can immediately tell that the girls were really not thrilled at first about the thought of "class" on a Saturday. Normal kid reaction, I guess. The smiles you see above were very forced for daddy's camera. It was like 10 or 11am, they had no idea what they were about to do, and there were about 6 other kids who they didn't know in the class. Saying they were hesitant would be putting it mildly. But then the class started. I stayed just to watch them and make sure they were cool. And I had to pay the $60 (yes, SIXTY dollars - $35 for the first kid, $25 for each additional child). The teacher was a young woman who I believe came from one of the nearby culinary schools. She pulled out a menu and explained to the kids what they'd be preparing that day. 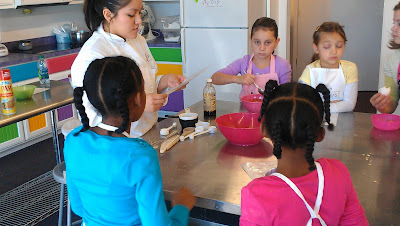 She told the kids that the entire class was INTERACTIVE which meant that they would all be pretty involved with the making of the food and then they all got little aprons. So far so good. Once the cooking started, my girls were good to go. 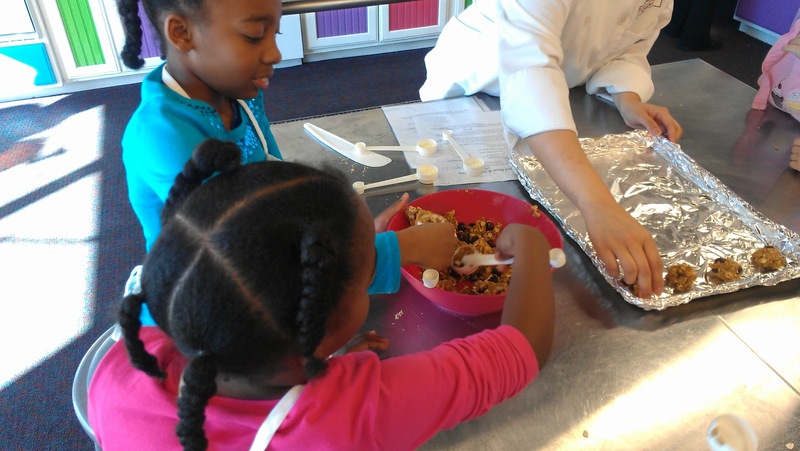 Each ingredient in their meal (that day I believe it was a bean dip, some lemon chicken, and granola cookies) was explained to them in detail. All of the meals are created to be healthy so each ingredient had a purpose. For example, there was a reason why avocado was used instead of another less healthy option. I forget what it was. But, if my girls weren't at school, I'm sure they'd tell me. The class was small. No more than maybe 8 kids total. So, each child was given individual attention from the teacher. 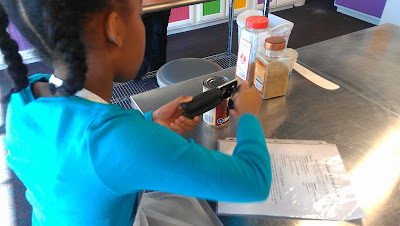 Everyone was given a chance to chop, stir, mix, pour, or contribute something to each portion of their meal. Each class lasts roughly an hour and a half. Just long enough to get everything in and just short enough to hold the kid's attention and keep them interested throughout. At the end of the class, the kids get to eat the food they made. And, parents are given a full menu of what was made that day so the kids can cook it at home. I would definitely recommend this place for ANY of you Lifers!!! My girls walked in the door in a very funky mood and left saying "When can we go back??" and "Can we go again tomorrow (Sunday)??" Uhhh, no! That hour and a half class cost daddy $60!!! Lol. But, their happiness and enjoyment made me want to figure out how to come up with the money to put them in the class on a regular basis or maybe for summer camp (which they do offer). Worst case scenario, one or both of them will do their birthday party there (which they offer as well). 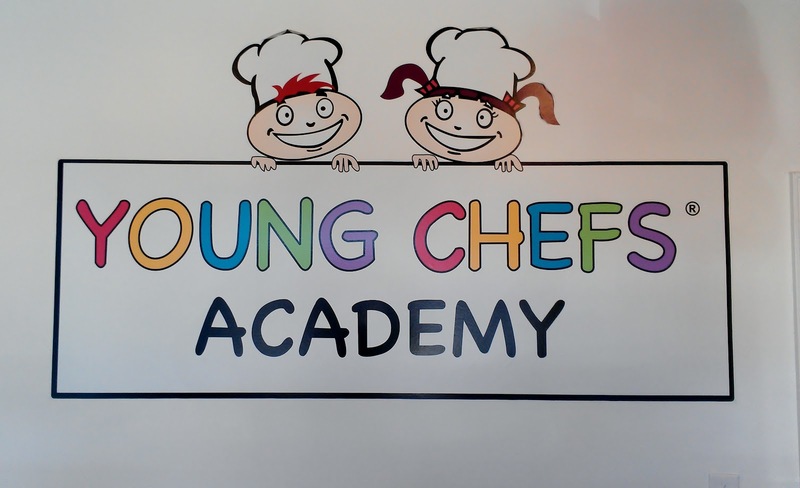 Give Young Chef's Academy a call or at least visit their website. I'm sure your kids will love it just as much as mine did. At least try it once. You won't be sorry. 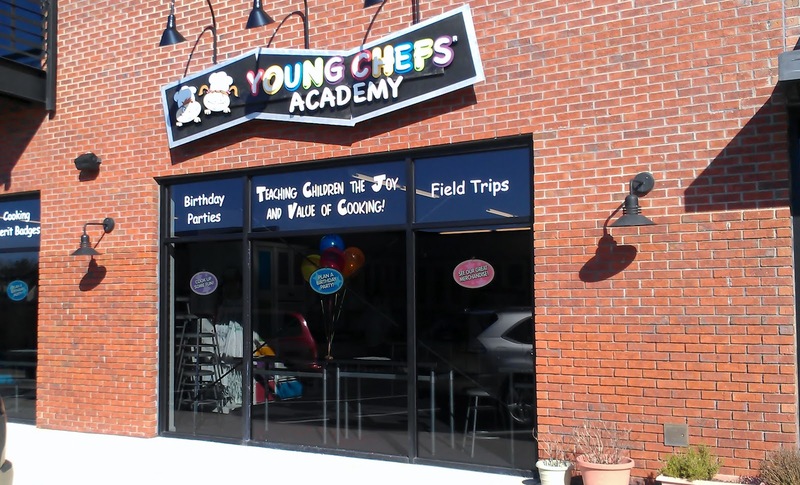 Thank you for the incredible review of the Young Chefs Academy of Sandy Springs! You're welcome! It was well deserved!!! My daughters will DEFINITELY be back!!! I used to teach at a YCA, and I LOVED every minute of interaction with the kids of all ages!